What goes around, comes around, and in the world of power generation, that means out-of-date technology goes into the dustbin of history when superior — and more economical — means of churning out electricity come on the scene. So it is with coal power. Here in the US, coal sputtered when nuclear energy came on the scene at the end of the 20th century. More recently, cheap natural gas and renewable energy have been bumping coal to the curb. Now a new report shows that rest of the coal world is also sliding down the same slippery sliding board of doom. The new coal power generation study is from the financial think tank Carbon Tracker, so the emphasis is on the economics of coal power plants. Unique in its class, the study is the first one to carry out a global analysis incorporating data from 6,685 coal plants worldwide. That’s not all the coal power plants in the world, but it does represent 1,900 gigawatts or 95% of the global operating capacity, as well as 90% of capacity under construction, so it accounts for most of the coal power in the world (the under-construction category totals 220 gigawatts). The unique, free-to-use online tool will be updated regularly, helping investors, policymakers and civil society develop economically rational plans to close coal plants and to understand the financial risk if they continue to operate. …42% of global coal capacity is already unprofitable because of high fuel costs; by 2040 that could reach 72% as existing carbon pricing and air pollution regulations drive up costs while the price of onshore wind and solar power continues to fall; any future regulation would make coal power still more unprofitable. What About Coal Power In The USA? The new coal power report’s findings on trends in the USA are especially interesting, and for that CleanTechnica sat down on the phone for a quick conversation with Matt Gray, a co-author of the report and head of power and utilities at Carbon Tracker (following comments edited for clarity and flow). CleanTechnica: What is different about the new report? Carbon Tracker: Historically, coal has been considered the cheapest form of generation without factoring in carbon emissions or air pollution. Carbon and air are the two externalities that most people think of. There’s also water use and water pollution. Our analysis excludes all these externalities and just compares the cost, and even on that basis we found coal not to be the cheapest. This is a landmark change in how we think about where we get our power from and what is the cheapest form. [Note: another externality is the ash problem, which has yet to be resolved]. 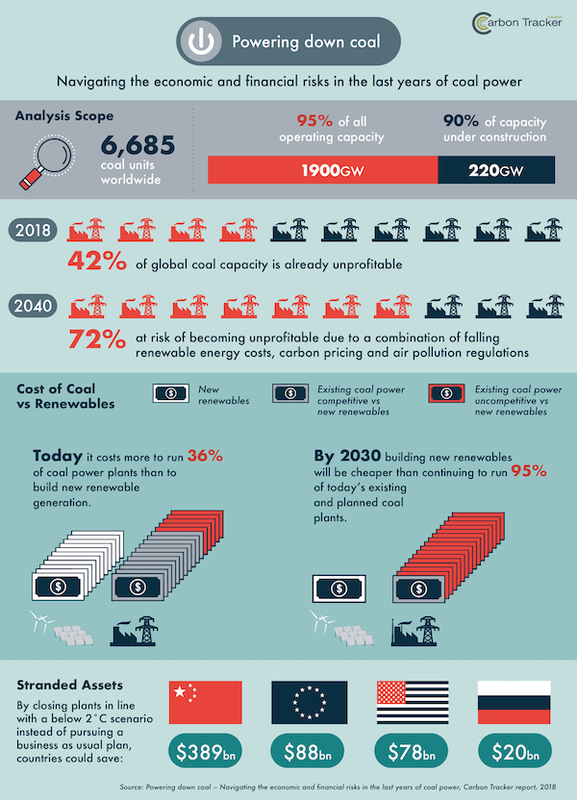 CleanTechnica: In your view, what are the main obstacles to transitioning out of coal? Carbon Tracker: The main obstacle is outdated regulation. For example, in the US there are liberalized and regulated markets. Coal is being phased out quite dramatically in the liberalized markets. In the regulated markets, however, coal is sheltered and the plants are staying in operation longer than they otherwise would. The US actually has some of the least competitive coal in the world. When we compared the operating costs of coal with the leveled cost of new renewables, we found that coal power in the US is some of the most un-competitive in the world. It’s quite a striking difference. So Much For Free Markets! If you caught that thing about un-competitive coal power plants, that’s rather ironic considering that one of the two major political parties in the US (you know who you are!) has made so-called free enterprise and deregulation the twin centerpieces of its appeal to voters. In the case of coal power plants, that puts US President Donald Trump in a bind. During his successful* 2016 presidential campaign he repeatedly promised to “bring all the coal jobs back.” The tactic worked, but it raised the question of how the President would actually get that done. So far during his tenure in the White House, coal power stakeholders have racked up one loss after another. To be fair, the Commander-in-Chief has launched a couple of proposals aimed at propping up the nation’s fleet of coal power plants. However, these have failed to pass muster with FERC, the Federal Energy Regulatory Commission. Rate-making policies are FERC’s meat and potatoes, and the new report indicates why the FERC commissioners have been giving coal the bum’s rush. In countries such as China, India, Japan and parts of the US governments typically approve the cost of generation and pass it on to consumers. Backing coal in the long-term will threaten economic competitiveness and public finances, because politicians will be forced to choose between subsidising coal power or increasing power prices for consumers. US utilities also see the writing on the wall, so it’s no surprise that the Trump administration’s coal-saving proposals are not making much headway. There’s a time factor at work. Power plants don’t last forever, and the nation’s existing fleet of coal power plants is well past due for upgrades if not total replacement. It would be hard to justify continuing to rely on coal when new, more economical — and resilient — alternatives are available. The pressure on utilities is also coming from major corporate ratepayers, which are increasing their demands for renewable energy in the grid mix. …it costs more to run 35% of coal power plants than to build new renewable generation; by 2030 building new renewables will be cheaper than continuing to operate 96% of today’s existing and planned coal plants. Promises or not, coal power was on the way out in the US before Trump took office primarily due to competition from low cost natural gas. Now that he is in office, renewables are giving both natural gas and coal a run for the money. Under Trump’s watch, coal power plants have continued to close, and there is far more pain ahead. All of this doom and gloom for coal has been occurring without pressure from the US offshore wind energy sector. That sector is finally stirring into life, and the construction of massive new offshore wind farms in the US is coming closer practically by the day. Image (screenshot): via Carbon Tracker.